For a long time, the oldest policy cell in the Union government was on bringing a lokpal law. The cell was abandoned after the lokpal law was enacted in 2013, even though the first lokpal is yet to be appointed. Another long-existing cell is on the Ayodhya dispute, which has seen the tenure of eight prime ministers in the past 29 years. Set up by V.P. Singh, the cell has been hyperactive or dormant depending on the way the situation develops. Headed by successive joint-secretary level officers who report directly to the prime minister, the cell has prepared innumerable position papers and draft parliamentary laws to find a solution to the biggest dispute involving faith in independent India. Now there is a chorus from rightist groups and parties, and many leaders of the BJP, demanding that the temple in Ayodhya be constructed by enacting a law by Parliament. BJP president Amit Shah, however, has stated that a judicial solution by the Supreme Court would be better. The apex court, which had fast-tracked the appeals against the Allahabad High Court judgment giving the disputed land to three claimants—Nirmohi Akhara, Sunni Welfare Board and Lord Ram himself—has now decided to take up the case only in 2019. Narendra Modi, who had maintained a stoic silence on the issue in tune with his 2014 desire for a moratorium on controversial issues, has now opened up. He has not revealed his mind on bringing a law, but has criticised the Congress for seeking a postponement of the Supreme Court hearing and also for intimidating the then chief justice Dipak Misra by an impeachment notice, which Rajya Sabha chairman and Vice President Venkaiah Naidu rejected. 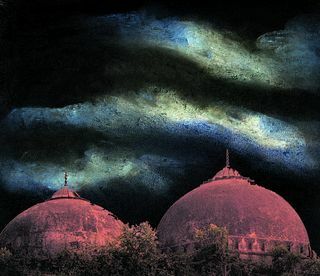 Interestingly, during the past four and a half years, government lawyers have never asked the Supreme Court for an early hearing of the Ayodhya appeals. Like his predecessors, Modi, too, has avoided a visit to the site in Ayodhya, where the VHP karsevaks pulled down the Babri Masjid structure in 1992. He has avoided a public discussion on the dispute, though there have been discussions within the government and the party. The prime minister’s office has reached out to Muslim organisations, checking for a negotiated settlement where a grand temple is allowed by consent. While Shia leaders of Uttar Pradesh, who have no stake in the dispute, have made favourable noises, the dominant Sunni groups have not changed their stand. The easy part for a law to be enacted is that the entire disputed land is under the Central government’s control since the demolition. The law can extinguish the claims of all groups in national interest and hand over the entire land to an identified group for constructing the temple. But legislation has to pass through Parliament and that is where the problem lies. While the BJP is just below the majority mark in the Lok Sabha due to deaths and resignations, the NDA has a clear majority. The Shiv Sena, a major ally, has taunted the BJP for lacking the guts to bring a law. But another major ally, the Janata Dal (United), has said it will not support a law by preempting the Supreme Court. When Parliament meets on December 11 for the one-month winter session, which is likely to be the penultimate session of the current Lok Sabha, the NDA is not in a majority in the Rajya Sabha. Even though Speaker Sumitra Mahajan has certified several bills as money bills, which require only the Lok Sabha’s approval, the Ayodhya law cannot masquerade as a money bill. With elections round the corner, the bill may not get majority votes. However, the government can claim it made an attempt. But Modi hates failures. The outcome of assembly elections, especially if it is a total triumph or disaster for the BJP, may influence the government thinking.